This large pennant-shaped sampler combines scenes from Arthurian legend and motifs from medieval art. 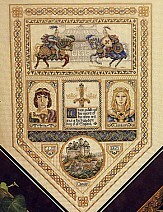 A jousting scene, portraits of Arthur and Guinevere, and a vine-and-lattice border are all stitched over-one. A circular medallion at the bottom of the sampler depicts Camelot, and the piece may be personalized with initials and date. A border composed of interwoven celtic-inspired motifs finishes the sampler.